Cute red vintage hand knit cardigan sweater by Signatures by Northern Isles. Features a serene farm landscape, with a cow, pig, hen and chicks, farmhouse, farmer with horse and wagon, a shining sun and farm fields on the sleeves. Women’s small. No holes, rips, tears or stains. Hand made, easy on and off, looks cute on all chickens hen or rooster, Roosters are a little hard to put on but they fit . We will offer Bantam, Jumbo poultry and rooster sizes soon soon. Pink Chicken Girls Sweater . Condition is Pre-owned. Size 12 Hardly worn. Very soft cotton. Cute Chicken Sweater Vest by Mandal Bay Size Med. 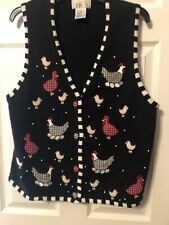 Cute Chicken Sweater Vest by Mandal Bay Size Med.. Vest has covered buttons and features chickens. Also had one chicken on best back. Condition is Pre-owned. Item has no flaws or imperfections! Shipped with USPS Priority Mail. Note: The chickens on the sweater do not lie flat on the sweater. Condition: In good pre-owned condition. Fun Colorful cotton knit button down Cardigan with a barn rooster chicken wheat heart Apple farm scene. Cotton ramie blend. Hand wash. WE USE A FABRIC DISINFECTANT ON ALL OUR CLOTHING. NEW OR PRE-OWNED. Width: 20" Length: 25" Shoulder to Cuff: ". This is a charming custom decorated, gold/yellow cardigan sweater. The actual sweater was made by Lee. Size Large. The fabric is heavyweight sweatshirt material (50% cotton/50% polyester). Way too cute! IT HAS ROOSTERS AND CHICKENS ALL OVER IT. THEY ARE APPLIQUE AND EMBROIDERY. IT EVEN HAS CHICKEN BUTTONS. MADE OF 55% RAMIE AND 45% COTTON. I WILL DO WHAT I CAN TO MAKE THE SITUATION RIGHT. I WANT YOU TO BE HAPPY. For your consideration is a Thanksgiving themed sweater from H & M. It is cream colored and the front has a fabulous sequin turkey and reads "I'm Not A Chicken" also in sequins. The sweater is a size US XS. It is made of 50% Polyamide, 44% Viscose, and 6% Alpaca. Machine wash cold gentle, line dry. This adorable sweater is in nice, gently preowned condition and comes from a smoke free home. You will steal the show wearing this on Thanksgiving. Rooster, Chicken Knitted Embroidered Sweater Cardigan Jacket. Wear for Easter, Halloween, Ugly Christmas Party! Looks like XL~2XL. Sleeve B (Seam to end of cuff). See photos for details about condition, and any flaws the item may have. CJ BANKS 2X 2XL NAVY Blue Red & White Rooster Chicken Sweater NICE! Up for sale is this nice looking CJ Christopher & Banks Rooster sweater! It is a navy blue patriotic style. Gently preowned. It looks great. And will have signs of use and or wear. What you see is what you get. Whimsical Campbell's Soup Sweater. by Eagles Eye. Black with rooster design made of chenille, embroidered leaves & scroll work up front, around cuffs & hem. Beads throughout pretty beaded buttons. Cute sweater. Back: neck to hem -- 26". 55% ramie, 45% cotton. Textured design includes birds (chickens?). and hearts. Hand knitted Sweater. 80% acrylic. 10% angora rabbit hair. Beige with taupe and multi-colored details. the knitting is a loose weaved design at the darker colored seams. FREE SHIPPING ...... ! Roosters ... CHICKEN CARDIGAN Womens cardigan.sweater Zip front, crochet pull Thick Lots crochet, cross stitch, Very nice condition ladies, my measurments are done with item laying flat, across, seam to seam Bust. 22" across hem area. 22" length 25" shoulder to hem ******************************************** CHECK OUT MY STORE WHILE YOUR HERE! PLUS SIZE CLOTHING SHOES Purses SKIRTS, SKIRTS, SKIRTS, CHILDRENS FROM SMOKE / PET FREE HOME LOT OF FREE SHIP ITEMS ********************************************* I REFUND ONLY, IF I HAVE MISREPRESENTED MY ITEM! ALL RETURNS///SHIPPING IS BUYERS RESPONSIBILITY! Sweater by TIARA International 2004. Tulchan Vintage Cotton Jumper/Sweater Navy blue Mexican chicken design #320 Sm. This a really pretty sweater. Size is an XL. Nice for the lady who loves chickens. 55% Ramie and 45% Cotton. Long sleeve button front. Arm Pit to Arm Pit: 18".